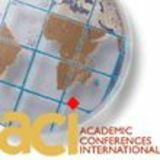 Adopting a Web-Based Collaborative Tool to Support The Manchester Method Approach to Learning Philip M. Drinkwater, Christine M. Adeline, Simon French, K. Nadia. Papamichail, Tudor Rickards, Manchester Business School, University of Manchester, UK Abstract: Manchester Business School employs a distinctive approach to learning known as the Manchester Method which is based on the principle that the most effective and rewarding way to learn and remember is through a practical reflective, live/real project-based approach. This paper investigates the use of a collaboration and information sharing application, IBM Lotus QuickPlace, for enhancing the Manchester learning experience. Keywords: Computer mediated communication; collaborative tools; group work; Information and Communication Technologies (ICTs); teaching and learning strategies; web-based learning. development. There has been little change from the original thought and design of the programmes; not to impart knowledge but to develop the skills of students (Wilson 1992). In the initial stage training is provided through intensive instruction in relevant disciplines and skills. The projects help the students in their personal development by allowing them to develop their skills. This strengthens the educative process allowing a multidisciplinary approach to problem solving to evolve into a more independent attitude to problem solving (Wilson 1992). The whole process leads the students from well-defined exercises and tasks through to open-ended tasks and problems which are unstructured and not well-defined. The Business Environment Project (BEP), which is the first real/live project, marks the transition to more active, self-managed learning (Rickards 2003). Learning is a journey and there are many paths that a student can take. The BEP reflects the key principle of the Manchester Method that students should learn to tackle real projects and acquire many disparate skills through their participation in group activities. As part of the development of the schoolâ&#x20AC;&#x2122;s eLearning strategy, a need was identified to invest in a project collaboration tool that would facilitate the co-ordination of group projects and enhance the learning experience. A decision was made to purchase IBM Lotus QuickPlace, a Web-based tool that facilitates information sharing and collaboration. This research explores the introduction of QuickPlace in project-based group work with the aim of exploring the schoolâ&#x20AC;&#x2122;s use of the system as part of its e-Learning strategy. of the research indicated that when students are actively involved in collaborative learning using an online method, the outcomes can be as good as or better than those for traditional classes. On the other hand when individuals are simply receiving posted material and sending back individual work, the results are poorer than in traditional classrooms. This stresses the importance of using communication tools in any learning environment and the importance of moderating the communication. Another study by Piccoli, Ahmad et al. (2001) compares a web-based virtual learning environment (VLE) to a traditional classroom by using a longitudinal experimental design. The study was conducted on two groups of students undertaking an introductory course in management information systems. One group undertook the course using a VLE whilst the other group attended the course in a traditional classroom environment. The findings revealed no significant difference in performance between the two groups. However although the students undertaking the course in a VLE environment did report a higher computer selfefficacy, they were less satisfied with the learning process. In summary, a fair amount of research has been conducted on the effect of ICTs on the educational environment and its effect on the performance of the students. While one can draw from these studies for insight, the introduction of emerging technologies requires further study and evaluation. The motivation for this research stems from the need to observe the use of ICTs within project-based group work in order to make necessary changes and achieve the best possible results. ensure that the technology adopted can enhance the learning process. At MBS the Manchester Method extends the education process to include learning-bydoing. As current e-Learning software packages are not well suited for such an environment, MBS explored other tools more suited to their approach to learning. When implementing a VLE, an organisation has various options, a bespoke system, a complete off-the-shelf solution such as WebCT or a modular approach combining off-the-shelf components with customised solutions. The advantages and disadvantages of these are discussed earlier in the paper. MBS has selected a modular approach combining offthe-shelf components with customised solutions. The reason is primarily because of their approach to learning – The Manchester Method. As part of the development of the school’s eLearning strategy, a need was identified to invest in a project collaboration tool that would facilitate co-ordination of group projects and enhance the collaborative learning experience. A decision was made to purchase IBM Lotus QuickPlace, a Web-based tool that facilitates information sharing and collaboration. This research explores the introduction of QuickPlace in project-based group work with a goal of enhancing the school’s use of the system in its e-Learning strategy. In addition to using QuickPlace, the IBM Domino platform and IBM Lotus Notes and iNotes applications for messaging and calendaring were also installed. A legacy system, an extranet, is also used by the school to distribute course materials and act as a repository of general information needed for the courses. The legacy, Microsoft platform, system is being phased out during 2004 and being transferred onto QuickPlace. Electronic Journal on e-Learning Volume 2 Issue 1 (February 2004) 61-68 the latest information. In addition, teams have a workspace to share information, collaborate and discuss through the use of discussion boards, chat (two or more members exchange messages by typing them in a chat window) and awareness capability (members can spontaneously encounter other members within the context of the content they have authored. e.g. reading a page in the ‘marketing room’ while the author of that page is online). It is also possible to use white-boarding to work on documents, manage and coordinate activities and track events. It also includes support for other activities associated with group-based project work such as task assignments and schedule management. As well as working online with QuickPlace it also offers the option to working offline. When a person works with QuickPlace online, they have to be connected to a QuickPlace server. However, if a user is remotely located and cannot connect to the QuickPlace server or would prefer to work offline to avoid connect charges, it is possible to take their QuickPlace offline. The offline QuickPlace is a copy of the online version and resides on the hard disk rather on the server. When the individual makes changes to the offline version and then synchronizes to the QuickPlace server - for example, when you add or edit pages in the place - QuickPlace automatically updates the online version. Some of the general characteristics of Lotus QuickPlace include: Primarily designed for smaller groups or teams Duration of usage is often limited or for a specific period of time Requires minimal infrastructure and support from ICT (self-service) Easy for users to create, manage and customize (self-service) Project-centred or activity-oriented Designed to facilitate enhanced collaboration Emphasis on user productivity and getting the job done Lotus QuickPlace can be viewed as an electronic project room. It provides not only a central location for sharing information but is flexible enough to grow and change with the project. It can be used “out-of-the-box” without any customisation. However to get the maximum benefit from the application, customisation is possible through various standard tools. report. The group report addresses the issues related to the project and may make proposals for the client. The individual report is part of the personal learning process in which the students reflect and discuss new skills learnt, the way the group arranged the work of group members and the way the group addressed unforeseen problems. 6. Lotus QuickPlace Design The overall structure of QuickPlace for the Business Environment project consists of several workspaces: a parent workspace template which holds general information about the project and is accessible by all students and staff concerned; a Group Workspace for each group which is accessible for only the members of the group and the staff concerned. within the “parent workspace”) for document storage. Its main use is to separate content and access. The reason for the library to be a room rather than a folder is that the students can organise the documents into folders. A room can have multiple folders but a folder cannot have sub-folders. The room is also equipped with an instructions page to guide the students on how to create folders and how to best use this option. During the project, the tutors provide specialist support and advice either on a one-to-one basis or during project clinics. In the parent workspace, rooms are introduced to support this process. In each room a discussion area that allows students to ask questions or initiate a discussion is provided. There is also a library folder for tutors to post references or documents that students may find useful. The idea of specialist areas is significant in supporting the Manchester Method. In the Manchester Method the tutors actively guide the students through the learning process. Specialist areas provide not only access to the right information but also the discussion channels for obtaining advice on issues and problems. Tutors are expected to log on regularly and answer questions or even instigate discussions, which can trigger reflection. The other options and folders are standard in a workspace. This includes the application for chat, sharing and online meetings. An index folder lists all pages and folders in alphabetical order and a members’ folder provides a list of all the members of the workspace. Electronic Journal on e-Learning Volume 2 Issue 1 (February 2004) 61-68 management skills that they can apply generically. The folder has a special form with questions that guides them on finding out the above. The students may then comment on other’s entries and start a discussion. The ideas and suggestions folder is an area for them to start a discussion on ways the group may work better or ways to tackle problems. The team dynamics room is designed and primed with three options that help students monitor the group processes as the team develops. The three options are the team factors measure (TFI 5) that assesses the effectiveness of the group along a number of dimensions such as creativity, the form/storm/norm /perform model and the option to discuss roles and personal differences in the team. In the current template the TFI option is done through an Excel spreadsheet. The form/storm/norm /perform model is a simple HTML form for the students to fill and the summary is displayed for them to monitor the changes over time. The personal differences in the team option, is designed for students to fill in their desired Belbin role and then for other students to comment and assign what they perceive the role of the person is. The calendar folder is for students to record events for the group. The system automatically copies all the events from the parent calendar to the group calendar. This is done through an agent written in LotusScript. The agent runs on a scheduled basis. This again makes it easy for the staff to post events to the group calendars as they only have to post it to the parent calendar. The tasks folder is a standard folder that allows the students to assign tasks and to monitor them. The tasks can be viewed in a Gantt Chart view or as a simple list. The tasks can be defined as milestones and can also be assigned to the calendar. Students who have been assigned tasks are notified by email of the tasks and reminders are sent by email as well. The expenses folder is there to help students record their expenses. The folder displays a summary of the expenses for them to print out for accounts purposes. An HTML form is custom built for this purpose. The other options and folders are standard in a workspace. This includes the application for chat, application sharing and online meetings. The index folder lists all pages and folders in alphabetical order for management the workspace. The members’ folder lists all members of the workspace. also the various requirements as dictated by the Manchester Method. It was challenging to understand how to incorporate all elements of the Manchester Method within the workspace. The first attempt of implementing such a workspace has been completed but it needs to be tested in a live situation. A very interesting finding of this study was the actual level of usage. There was a gradual increase in the usage as the project progressed. This finding suggests that the novelty of using the system did not diminish even though students did have other means of working such as central location on the server for data-storage and face-to-face meeting. Although the most common reason for using the system was for posting shared documents, some groups did make use of the various options such as the Learning Log, discussion forums and tasks. It was also encouraging to see that one of the groups went to the extent to customise their workspace themselves. The majority of the students in that group did have previous experience with using the system. This shows that the more familiar the students are with the system, they will use it to its maximum. The study has also provided us with a number of issues to consider for improving the use of the system within MBS’ programmes. It is clear that consideration of such issues as training, online moderating of discussion forums, online tutor presence and developing an online culture is needed if the full range of benefits is to be gained. Students must feel that the system is a part of their learning and development. collaborative environment based on IBM Lotus QuickPlace. QuickPlace is a system that offers many possibilities with a minimum of effort and provides many of the capabilities needed for a virtual learning environment. Although the study is limited to a specific project it has revealed that the use of the system can be successful. However, it is important to bear in mind that technology alone does not affect or enhance the learning process. 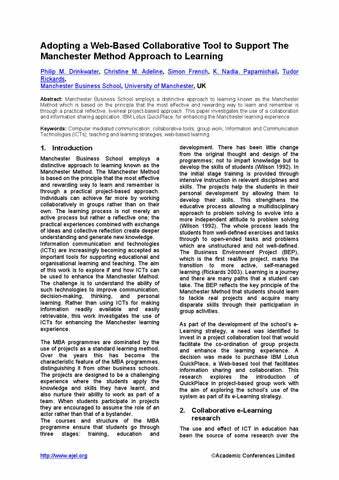 The use of Lotus QuickPlace at Manchester Business School represents a new challenge to faculty members, to adapt and change the Manchester Method of learning to best take advantage of the ICT tools. A survey has been undertaken to explore students' responses and reactions to QuickPlace in order to understand the system’s value in supporting the Manchester Method of learning, group work and personal learning by investigating how it was used, its overall usefulness and effectiveness. The results from the survey suggest that the majority of students made use of QuickPlace and were positive about using it in their project work and as a tool for learning. Electronic Journal on e-Learning Volume 2 Issue 1 (February 2004) 61-68 Learning land (understanding the potential of Virtual Learning Environments VLE Conference 24th June 2002, The Way Forward with VLEs: Lessons Learned, University of Bristol. Wilson, J.F. The Manchester Experiment: A history of Manchester Business School 1965-1970 Paul Chapman Publishing Ltd, London, 1992.